Alligator clips (or Crocodile clips, if you prefer) are likely to be the most useful thing on your workbench besides the workbench itself. 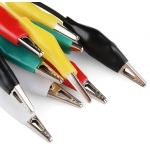 Whether you're just trying to make a few quick connections to test your circuit or having trouble making your multimeter leads stay where you need them, these spring-loaded clips are a workshop must-have. Each lead in this pack of ten is 50cm long with a rubber shrouded alligator clip on each end. 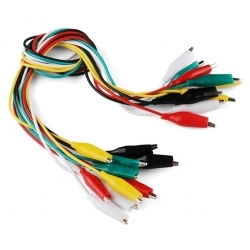 There are five different colours, you get two each of: red, green, white, black and yellow.